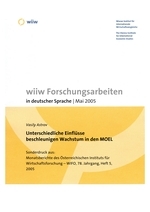 Die merkliche Wachstumsbeschleunigung, die 2004 in fast allen MOEL zu beobachten war, ging auf unterschiedliche Faktoren zurück. Die meisten Länder verzeichneten ein robustes Wachstum der Binnennachfrage. Die neuen EU-Länder profitierten auch von der relativ guten Konjunktur in der EU 15, die EU Beitrittskandidatenländer Bulgarien und Rumänien von der Steigerung der Zuflüsse an ausländischen Investitionen, die Westbalkanländer von größerer politischer Stabilität und verbesserten Aussichten für die EU-Integration. Russland und die Ukraine schließlich waren vor allem durch die hohen Weltmarktpreise von Energie und Metallen begünstigt. In 2004, nearly all countries of Central and Eastern Europe (CEE) recorded an acceleration of economic growth and once again outperformed in this respect the EU 15. However, the reasons for this have been different across individual countries. In the new EU member states domestic demand has picked up, Romania and Bulgaria have improved their competitiveness due to the surge in foreign direct investment, the Western Balkans have benefited from greater political stability, whereas Russia and Ukraine have taken advantage of the high world prices for their major export commodities: energy and metals. The accession of eight CEE countries to the EU on 1 May 2004 was well prepared and has provided an additional growth stimulus to the new EU member states, particularly for agriculture. The migration of labour force from those countries to the EU 15 has been moderate, despite the sizeable income gap and the stubbornly high unemployment, especially in Poland and Slovakia. The Baltic countries and Slovenia have already joined the European Exchange Rate Mechanism II and are planning to introduce the euro in 2007-08. However, in the remaining new EU member states persistently large public deficits are the main formal obstacle to adopting the euro in the medium term. The EU accession prospects for the countries of Southeast Europe have improved. Bulgaria and Romania have signed accession treaties with the EU and are expected to join in 2007. Croatia has been given the status of EU accession candidate, and Macedonia has applied for EU membership. Under an optimistic scenario the whole region might become part of the EU as soon as 2015. However, many of these countries face the task of solving the problem of huge foreign debt, which in several cases appears unsustainable. Russia and Ukraine are recording signs of 'overheating' due to the booming commodity exports and the resulting surge in current account surplus. The general macroeconomic picture is favourable, but serious structural distortions remain untackled, not least due to the rough climate for foreign direct investments.